One of the best blues bands of all time, The Aces featuring special guest Robert Jr. Lockwood. 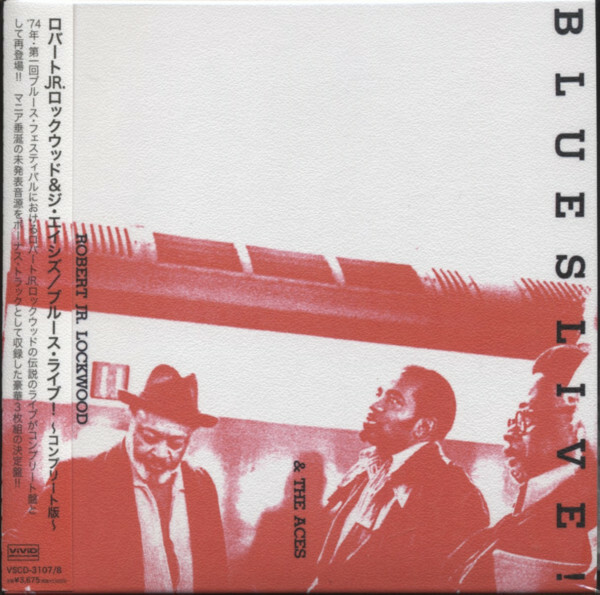 Superb live recordings, only available in Japan. More than half of the tracks remained unissued, until now. Also has two bonus tracks, featuring Hammie Nixon and Sleepy John Estes. Excellent performance, classic style Chicago blues at its very best. Highly recommended! ROBERT JR. LOCKWOOD gtr/voc, LOUIS MYERS gtr/hca/voc, DAVE MYERS bass, FRED BELOW drums. ROBERT JR. LOCKWOOD'S music shows the influence of not only his stepfather and guitar teacher, Robert Johnson, but also that of jazz guitarists Charlie Christian and Eddie Durham. Lockwood was born on a farm near Marvel, Arkansas in 1915. Once old enough to travel, Lockwood, like many promising bluesmen of the region, found himself drawn to Memphis. There he played solo along Beale Street and as Sonny Boy Williamson's original guitarist on what is reputed to be the world's first blues radio broadcast: "King Biscuit Time" on KFFA, Helena, Arkansas. In the late '30s Lockwood moved to St. Louis where he met and played with Dr. Clayton, the great African-born blues giant. Robert's recording debut was on a 1941 Dr. Clayton session done in Chicago for Bluebird. The same year he made his first recordings under his own name for Lester Melrose, also issued on Bluebird. Robert stayed in Chicago, although he often returned to Memphis and Arkansas, and by the mid-50s he found himself in the enviable position of being THE studio guitar player in Chicago. He can be heard on classic blues songs like Little Walter's My Babe and Boom, Boom, Out Go The Lights; Sonny Boy Williamson"s Nine Below Zero and Eyesight To The Blind. family remained in Cleveland. He stayed off the scene for a while spending more time as a family man. Exciting performances at the 1972 Ann Arbor Blues Festival, in Toronto and at other festi-vals helped put Robert back into circulation. This 1970 session was Robert's first album as leader! There were three more Lockwood albums released around the same time (Contrasts and Robert Jr Lockwood Does 12 on the Trix label and Blues Live in Japan on Advent). Robert Jr. Lockwood stayed active on the international blues scene and resided in Cleveland until he passed away on November 21, 2006. Customer evaluation for "Blues Live! (3-CD)"